Did you know that Collage in French is...well, still Collage? 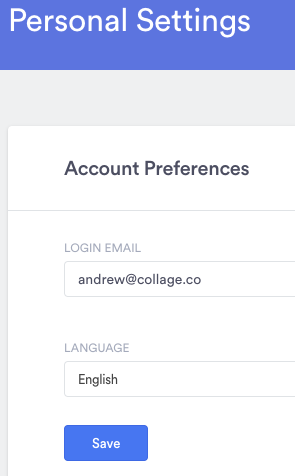 To reflect our bilingual name and growing bilingual user-base, Collage is now fully available in English and in French. To change your language preference, click on your name in the top right and select "Personal Settings". Look for the "LANGUAGE" drop down and set it to your preferred language. Managers or admins can now easily record time off already taken on behalf of an employee. Simply navigate to the employee's profile, click on "Time Off" and you will see a blue button titled "Record Time Off". If you are a company with remote employees, you can now create a new location and call it "Remote". No need to enter a country or specific region. When using Collage ATS to recruit and hire remote employees, you can select "remote" as the option that candidates will see. Our new Time Off setting allows admins to schedule time off policies to begin accruing on each employee's individual start date. This makes tracking balances much easier for all parties. Manage confidential or sensitive information with our new document sharing settings. Select which documents can be shared with employees and which should remain visible only to admins or managers. To access this setting, click on the three grey dots on the right side of the document in question (you'll have to hover your mouse in order to see them), then select "Edit". 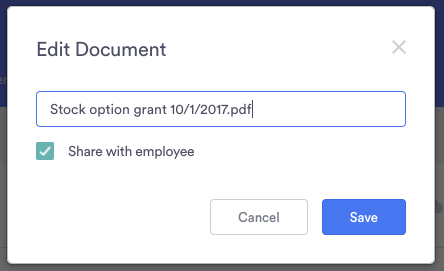 By default, all new documents will be hidden from employees until you select "Share with employee."